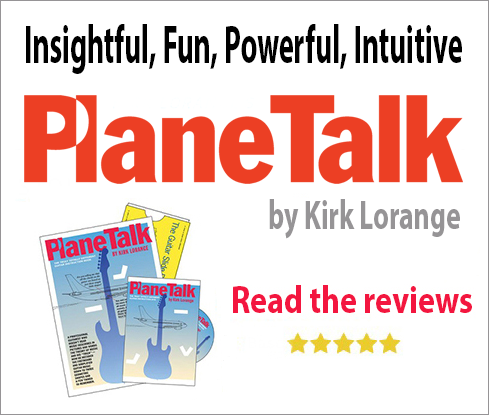 Don't Think Twice, It's All Right - A Fingerstyle Guitar Lesson by Kirk Lorange. I did a lesson on this picking style many years ago and -- amazingly -- I still have it. I have re-uploaded it and I suggest you have a look at it first. It demonstrates the finger picking pattern that has been used countless times over the years. I chose Bob Dylan's "Don't Think Twice' chord progression as it's one we're all familiar with but it can apply to any old progression. The old lesson is a good to start out with as I color coded the tab and added a half-speed version of the video so that you can really zero in on the pattern. Once you get that basic pattern down, move on to this new lesson, in which I add a few melody notes from the tune itself. I also added a couple of new chords to the progression in this new one. And here is the new lesson. You will quickly see that trying to add those few extra melody line notes into the pattern is like trying to pat your head and rub your belly at the same time. Just take it slowly and refer to the tab for those sections. The trick is to understand that sometimes you need to pluck two notes at once, and the tab will show you where. I do realize that trying to make sense of the dots flying around the virtual fretboard is a waste of time. I did them anyway ... took me a long time too! I could ramble on and on here about all the minute details of this kind of thing, but when it all boils down, words won't do anything to help. There is only one way to master this (something I have yet to do) and that is to put in the time. To get that thumb/fingers independence happening requires a whole lot of playing. I know because I have been trying to re-familiarize myself with it over the last few days and it's very trying. You think you have it down, then it all goes away for a while, then you try again with some success, then it's back to square one. Perhaps someone with more natural ability can get there quicker, but I think most of us find this 'melody-line-insertion-into-regular-picking-pattern' style very challenging. 1. Take it really slowly at first ... really slowly. 2. Watch you picking hand. When you have it down pat, you can close your eyes or look around the room, but while you're working on this, watch what's going on, and keep reminding yourself that you are indeed the boss of those fingers down there at the end of your arm. 3. Keep it rehearsed. In other words, once you do get it happening, make sure you play it regularly. My problem was that I don't really play this kind of music anymore. I used to, and I used to be much better at it. Practise does indeed make perfect. 4. Don't be shy about using a capo. Certain keys are a lot more friendly for Travis Picking, C being the best probably. You'll notice that this is in the key of E, but played as if it's in C. To play this in the key of E without a capo would sound very different. G and A would are also good keys. Capo's are a great invention and if anyone tells you it's 'cheating', tell them they don't know what they're talking about. The only aim is to make nice, flowing music, and capos help to achieve that.